Rapid urbanisation, growing urban populations, environmental issues and climate change all represent significant challenges for water resource management, the delivery of essential water and sanitation services and environmental protection. As a result, traditional approaches that have relied heavily on large-scale infrastructure development are making way for new approaches such as the portfolio-based approach to planning and management. In an urban context, this includes integration of all components of the urban water cycle, and most state governments in Australia have embarked on implementing this integrated approach by having a mix of water supply sources including demand management and conservation measures. However, effective implementation of this approach depends on policies and regulations and encounters various impediments. Accordingly this chapter focuses on the City of Adelaide in South Australia and explores the legal and policy challenges for implementing an integrated urban water management plan in Metropolitan Adelaide. Drawing on the results of governance studies carried out in Australia that included a literature review, stakeholder and community surveys, the chapter attempts to better understand the barriers to transitioning Adelaide to a water-sensitive city. Over half the world’s population now lives in urban areas, and most of the population growth over the next four decades is expected to take place in urban areas (UN DESA 2014). This represents a considerable challenge for water resource management, the delivery of essential water and sanitation services and environmental protection. To help meet these challenges and better serve both economic and environmental objectives, there is a need to employ a broader range of tools than in the past. This means that traditional approaches which have relied heavily on large-scale infrastructure development (dams, levees and conveyance facilities) have to make way for a new integrated approach – integrated urban water management (IUWM) – which is the integration of all components of the urban water cycle. This integration takes place within the city’s urban development and in the context of wider basin management to achieve sustainable economic, social and environmental goals (Bahri 2012; World Bank 2012). Consequently, there is a shift in urban water management from a system relying on climate-dependent traditional water resources to a portfolio system that uses several sources. The portfolio paradigm includes both demand and supply management measures, and Table 6.1 compares the “old” and “new” paradigms of urban water management. Convey stormwater away from urban area as rapidly as possible. However, implementation of this approach encounters various impediments that are mostly related to governance. Governance of water resources is a long-term and complex affair involving different levels of actors at different scales, from households, irrigators and industries to the governments (Laban 2007; McKay 2007). The interactions between these actors should be considered when promoting local water governance (Laban 1994, 2007), and this is true in the case of both rural and urban water management context. This chapter focuses on the latter, and using Adelaide City in South Australia as a case study, it attempts to explore the legal and policy challenges for implementing an IUWM plan in Metropolitan Adelaide. Australia, like many countries around the world, has embarked on implementing the IUWM approach to supply and secure water for urban areas. The overall strategy is to develop efficient and flexible urban water systems by adopting a holistic approach in which all components of the urban water cycle are integrated and includes a mix of water supply sources – freshwater (surface water, groundwater) and produced water (desalinated water, stormwater and treated effluent). Deliver urban water supplies in accordance with agreed levels of service. Base urban water planning on the best information available at the time and invest in acquiring information on an ongoing basis to continually improve the knowledge base. Adopt a partnership approach so that stakeholders are able to make an informed contribution to urban water planning, including consideration of the appropriate supply/demand balance. Manage water in the urban context on a whole of water cycle basis. Consider the full portfolio of water supply and demand options. Develop and manage urban water supplies within sustainable limits. Use pricing and markets, where efficient and feasible, to help achieve planned urban water supply/demand balance. Periodically review urban water plans. The aim of these principles is to provide Australian governments and water utilities with the tools to develop plans to manage the supply/demand balance of a reticulated supply for an urban population. Therefore adoption of a portfolio water supply approach is a high policy priority for all the state governments in Australia. However, implementation of this approach depends on policies and regulations and encounters various impediments. From the literature related to urban water management, it is evident that while progress on the scientific and technical aspects related to IUWM has been admirable, there are significant institutional aspects that need equal attention. Our own studies on water governance in Australia (McKay 2005, 2007), particularly on urban water management (Keremane et al. 2011; Wu et al. 2012; Keremane et al. 2014), and other studies (e.g. Maksimović and Tejada-Guibert 2001; Brown et al. 2006; Mitchell 2006) have identified a wide range of social and institutional barriers to adoption, including insufficient practitioner skills and knowledge, organisational resistance, the lack of political will, limited regulatory incentives and the lack of institutional capacity. Unlike other countries, in Australia the water reforms have led the state governments and their agencies to better align planning and development requirements with an integrated approach to the management of the urban water cycle, but a range of governance factors including regulatory conditions, management systems and institutional arrangements are impeding new practices. Furthermore, there are acute path dependency issues introspectively for each state and hence federal, state and private sector relations issues. According to Dovers (2008) water institutions in Australia generally operate within an institutional system that is consistent with past rather than present knowledge and imperatives. With regard to urban water management, “the co-evolution of institutions and large-scale technological infrastructure generates an interdependence that makes urban water regimes resistant to change” (Wallington et al. 2010). However, in recent times many new proposals such as a harmonised system of laws and privatisation of public infrastructure are on the table (Infrastructure Australia 2013); the privatisation issue is discussed in more detail later in the chapter. While it is widely acknowledged that it is time for new approaches, such new approaches are able to evolve within a dialogue-based system as demonstrated with the Basin Plan which was embedded in several state-based Australian multi-stakeholder processes. Nevertheless, Australia has the institutions and the democratic structure to form models to enable the transition to a portfolio approach. Most state governments in Australia have embarked on implementing IUWM by having a portfolio of water supply sources. This chapter focuses on the state of South Australia, which is already a well-recognised leader in many aspects of urban water management, particularly stormwater harvesting and reuse, and wastewater reuse. Furthermore, in October 2014 the South Australian Government released an issues paper that stated the Government’s commitment to furthering the urban water management reforms by developing an innovative integrated urban water management plan for Greater Adelaide. (DEWNR 2014: 3). Accordingly, this chapter attempts to explore the legal and policy challenges for implementing an integrated urban water management plan in Adelaide. 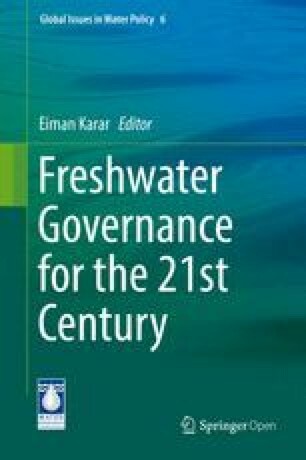 As mentioned earlier, this chapter is based on our previous work related to water governance in Australia, particularly two studies: (1) a legal and governance study to identify governance challenges and potential options to support the implementation of an IUWM plan in Adelaide and (2) examining urban community perspectives about water governance in Australia. The first study included a national and international review of literature on institutional arrangements for diversifying the water supply source portfolio, face-to-face discussions and an online survey of key actors representing different stakeholders/agencies (e.g. SA Water, DEWNR, local council, etc.) that are involved in delivering safe and secure water and wastewater services to Metropolitan Adelaide (see Table 6.2). The second study was an online survey of urban communities in three Australian cities, namely, the cities of Salisbury and Charles Sturt in South Australia and City of Gold Coast in Queensland. The online survey was conducted using an e-mail list bought from a permission-based and research-only internet panel of a marketing company. This meant that e-mails were sent only to those people who had subscribed to receive e-mails from this company for research purposes. Respondents were offered an incentive to enter into a draw for one of eight Coles gift vouchers each valued at AUD$50. In total, the survey was sent to 6 000 randomly selected e-mail addresses, with 370 valid responses. We acknowledge that the response rate (6.22 %) is low, and thus the results are likely to be biased. Also, the e-mail addresses bought were from three specific locations in Australia and hence cannot be generalised. We note these as the limitations of this study. The objective is to secure water supply to the cities now and in the future. However, implementation is the challenge because management of water in Australia is a complex process; the following section provides an overview of the complexity. Water management in Australian states and territories is the responsibility of various government agencies, water authorities and water utilities. Responsibility for regional and local water management lies with various organisations, including catchment management authorities, rural water utilities and local water utilities. These organisations undertake a range of regulatory, administrative and governance functions, and as a result there are different institutional models for water management. Regarding ownership of the assets and operations, state or local governments own all the water utilities in Australia. With the exception of some irrigation schemes, there has been little privatisation in the water sector. Australia also has an effective regulatory regime to protect public and environmental health along with an economic regulator in each state assigned with the responsibility both for prices and for customer service standards. More details of these arrangements are discussed later in the chapter. The water industry in Australia operates under state laws, and as a result, different states and territories have introduced such reforms at different rates and in different ways (Srivastava 2004). Because of power sharing, each state government has created its own unique system for the allocation and use of water, and so the bodies providing water, gas and electricity have become powerful in each state, with little evidence of working together (McKay and Halanaik 2003). This has led to issues related to sharing of water resources, which in turn has forced the states to form agreements such as the Murray-Darling Basin Agreement and the Border Ranges Agreement (McKay 2002). This subsequently moved to a further set of reforms within the Australian water sector, and since 1992 the Australian Government has embarked on two phases of ambitious reform of state laws and policies for water management: the first in 1994, known as the Council of Australian Governments (COAG) reforms, and the second in 2004, known as the National Water Initiative reforms (McKay 2006, 2007; Hussey and Dovers 2006). This was followed by the passing of the Water Act 2007 (Commonwealth) which set down a detailed regime for the use and management of Australia’s water resources, most significantly through requiring the development of a “Basin Plan” (Kildea and Williams 2010). The Basin Plan was adapted by the Minister in 2012, and it envisages an integrated approach across jurisdictions. However, much of its implementation will take place through state water resource plans (Kildea and Williams 2010). Furthermore, water management in the states and territories is the responsibility of various government agencies, water authorities and water utilities. Responsibility for regional and local water management lies with various organisations, including catchment management authorities, rural water utilities and local water utilities. These organisations undertake a range of regulatory, administrative and governance functions. Accordingly, across Australia there are different institutional models for urban water management. For example, in both Western Australia and the Northern Territory, the water service provider owns and operates its assets. In South Australia, the water service provider owns the assets, but operation and maintenance of the infrastructure have been outsourced through a long-term contract to a consortium of private firms – ALLWATER. In the Australian Capital Territory (ACT), the water and sewerage assets and business are owned and operated by ACTEW Corporation (ACTEW), which is owned by the ACT Government. Table 6.3 indicates the institutional arrangements in all the Australian states. With respect to ownership and operations, state or local governments own all the water utilities in Australia. With the exception of some irrigation schemes, there has been little privatisation in the water sector. However, there has been restructuring and institutional role separation within the public sector departments. The public sector departments have been transformed to corporations, subject to the same laws that govern the private sector and with clear commercial objectives (Srivastava 2004). Further, a number of water utilities have contracted out their design, construction and various operational roles to the private sector through service or management contracts. Regarding the regulatory models, Australia has a variety of regulatory regimes: health regulation, environmental regulation and economic regulation. An economic regulator has the responsibility both for prices and for customer service standards. The emerging trends and practices in Australia with respect to economic regulation show a clear shift towards independent regulation, and most of the state and territory jurisdictions favour a multi-sector approach. For health regulation, in almost all the states, the health department controls compliance with national water and sewage quality standards. Environmental regulation comes under an Environment Protection Authority/Agency (EPA) in all states, except in Western Australia and the Northern Territory, where it is the responsibility of a government department. A review of the literature suggests that there are significant institutional aspects that need equal attention while implementing an integrated urban water management strategy. Accordingly, a study was conducted in South Australia to assess the legal and governance implications of IUWM and to explore the management issues related to diversifying the supply portfolio in Metropolitan Adelaide from institutional perspectives. The idea was to work with key stakeholders in government and the private sector to identify challenges and possible solutions, based on South Australian law and national and international experience. Solutions for implementation could include legislative (changes to the law), regulatory (changes in the way the law is implemented) and institutional (changes in the governance of water supply and management) aspects. As indicated in Table 6.2, the stakeholders who took part in the study were from a breadth of organisations involved in urban water management, thereby providing a good representation of the South Australian urban water sector. Moreover, they all had significant experience in planning and operating their systems in the face of uncertainties associated with future hydrology, weather, available water supply and projected water demand (which was a main selection criterion for participation). Table 6.4 summarises the major issues and potential solutions for implementing an integrated strategy in Adelaide, South Australia. These data were drawn from the literature review and the interviews. The following section discusses these issues in detail from the point of view of the key stakeholders. The challenges and potential solutions to facilitating the implementation of IUWM in Adelaide were identified through preliminary discussions with the stakeholders. Literature reviews and documentary analyses also informed this process. For a more detailed examination, these issues were then organised into two categories – policy challenges and legal challenges – and the participants were asked to rate the specified challenges by using “agree and disagree” scales. They were also encouraged to identify additional challenges and/or make further recommendations in relation to overcoming these challenges. The results are presented in Table 6.5. The main findings from the analysis presented in Table 6.5 are aligned with Giordano and Shah (2014) who argued that, in essence, integrated water resource management is a call to stop fragmentary approaches to water management. Fragmentation occurs where responsibility for water governance is allocated among multiple actors and/or agencies with relatively little, or no, coordination and a lack of clarity around how final decisions are made (Bakker and Cook 2011). Water management in Australia is characterised by a lack of intergovernmental coordination, as indicated by the study participants who state that “too many different regulations and licenses are administered by a large number of different government agencies”, and there is a “lack of [an] integrated framework to draw policy perspectives together” (see Table 6.5). The relationships among key players were considered to be complex, and the “lack of clarity on rights and responsibilities for all aspects of water management and use” was considered as a very real concern to implementing the IUWM plan in Adelaide for operators, as was the long processing time required for licensing. To some extent these issues are universal given that water is a multipurpose flow resource that constantly transgresses political boundaries, authority over which is continually negotiated between different users, sectors and scales of governance. This raises the issue of how best to address the fragmentation that is so characteristic of water governance (Keremane et al. 2014). The setting “up [of] a process to work more collaboratively” and the “develop [ment] of an integrated water management plan” were strongly recommended by the participants. “A clear lead role for one agency” or “co-ordinat[ion] through one state agency” were other suggestions put forward by main actors (see Table 6.5). However, the participants pointed out that “there is a danger that this would add one more layer to the complexity” and that the “lead agency will be crucial for ownership, but must be careful not to only have one perspective (e.g. environmental and not industry)”. “Cross-boundary disputes” and “unclear property rights/ownership rights for non-prescribed water sources” were considered as important legal challenges to the implementation of an integrated urban water management plan in Adelaide. However, “unclear access rights to water sources on private land” and “unclear private ownership of water courses” were not viewed as major challenges. The participants argued that ownership is clear but not well understood and expensive for individual landowners. As quoted by one, “according to legislation, watercourse ownership is clear. What’s not clear are the obligations attached to this”. The participants argued that “this extends throughout the water, wastewater, and recycled water markets, whether by local government or the private sector. Unless sustainability can be re-integrated into water policy, there will be a disintegrated approach that simply drives water sources to be least cost”. The participants strongly recommended that “certainty, collaborative effort for [the] best policy instrument” was needed to overcome the challenges. Some of the other possible solutions identified included “clarify[ing] the ownership of stormwater and water in the creek if they need to be part of the optimal mix and in case of aquifer recharge-injected water entitlements” and having “a clear Act for a multi-purpose sustainable IUWM strategy/plan”. However, the participants acknowledged that in practice, it may take a considerable amount of time to achieve certainty and collaborative effort for a best policy instrument and clear ownership. In the literature, there is agreement about the hurdles faced in implementing an IUWM plan, and two factors – organisational culture and institutional capacity – emerge as important elements that influence this change, particularly with respect to the diversification of water sources (Wallington et al. 2010). Organisational culture is defined in many different ways in the literature. However, the most commonly understood definition of organisational culture is “the way we do things around here” (Lundy and Cowling 1996: 168). Another important issue related to implementing the “new” strategy is institutional capacity. The building of institutional capacity is important for encouraging institutional change (Brown and Farrelly 2009). Also, as Wakely (1997) argues, institutional capacity determines the ability of an institution to perform effectively at its own tasks and to coordinate with others in its field. In addition, within the water industry, as argued by Mukheibir et al. (2014: 71), “the rigid cultural norms of organisations, professionals and academics … and capacity development, are barriers to integrated and innovative water management”. In this regard, the aim of this study was to examine the perceptions of the key stakeholders in the South Australian urban water sector about these barriers (see Fig. 6.1). …, the culture is one where mistakes are never acknowledged. The organisations do not hold themselves accountable for their failings and broken promises. Until this can change, the entire sector will be uncertain. In terms of the significance of the impact of these barriers, the abovementioned issue of organisational culture was followed by institutional capacity, institutional uncertainty about access rights and institutional uncertainty about the ownership of water. Full compliance with environmental regulations and public health regulations was not considered to be a major barrier. See Keremane et al. (2014) for further discussions on these issues. In fact, “institutional capacity” was not considered to be an issue by the participants; they only considered it to be too dispersed/unfocused at present. This was primarily considered to be a financial issue about the resourcing of SA Water and Department of Environment, Water, and Natural Resources (DEWNR). The participants further indicated that “institutional uncertainty about the ownership of water” and “institutional uncertainty about access rights” depended on the source and were related to non-prescribed sources only. These were primarily related to stormwater reuse and managed aquifer recharge (MAR) schemes. “Full compliance with public health regulations” was not considered as a major barrier to the implementation of IUWM in Adelaide; however, “compliance” was perceived as being necessary. The participants agreed that “IUWM must be established to be environmentally-sustainable”. Rather than a barrier, “full compliance with environmental regulations” was considered to be a driver because more wastewater and stormwater reuse results in less environmental impact on marine waters. In addition, “environmental regulation” was criticised as being “a rubber stamping exercise” and “the real barrier is that organisational players cannot make clear commitments towards how they will protect and enhance biodiversity, or how they will transition towards truly sustainable management practices”. From the literature and discussions above, it is clear that the impediments to implementing an integrated approach are not generally technological, but are instead, socio-institutional. In this study the stakeholders were asked to voice their opinion about demand management and the existing governance arrangements related to different water sources available in Adelaide, and the results are illustrated in Fig. 6.2. From their responses, it is clear that DEWNR was seen as being responsible for the management of the catchments and groundwater, while SA Water played a larger role in governing desalinated water and recycled wastewater. When it comes to stormwater and rainwater, local governments had a major role to play. Unclear who is responsible or the driver for what… Near impossible to get diverse water supply projects being undertaken. State gov. has no funding, staff or capacity to implement or administer/approve others to implement. Too many BODIES trying to apply too many POLICIES for such a complex and life-critical resource. Highly fragmented with differing responsibilities with established cultures. In addition, 26 % of the respondents indicated that the arrangements are good and said that “governance arrangements only need fine tuning – no perceived need by the public means no leadership by the political class”. It was interesting to note that none of the respondents stated that the existing arrangements are very good while 19 % were neutral (Fig. 6.3). The stakeholders were further asked to indicate who, according to them, should be governing these water sources; the results are illustrated in Fig. 6.4. A major change, as indicated by the figures, is that most of the stakeholders wanted DEWNR to play an enhanced role in the management of the “new” water sources, such as stormwater, rainwater, recycled wastewater and desalinated water. We could consider a high-level small Adelaide Water Authority reporting direct to / or chaired by the Minister with sole responsibility for Adelaide’s source water supplies. This Authority could consist of a rep from each of these existing orgs. I’ve indicated DEWNR from the list however consideration of a multi-stakeholder supported entity possibly lead by DEWNR may also be considered. The survey further asked the stakeholders to respond to a question specifically related to who should control access to Adelaide’s “new” water sources (see Fig. 6.5). The majority of the stakeholders perceived that SA Water should control access to desalinated water (80 %) and recycled water (>60 %). In relation to stormwater, the majority of the stakeholders (>70 %) were of the opinion that DEWNR should control access, followed by local councils (around 60 %). In the case of rooftop water/rainwater, more than 60 % of the stakeholders felt that local councils should control access, followed by DEWNR at around 37 %. Adelaide needs a respected body strong enough to oversee the management of Adelaide’s Total Water Sources. Under current governance arrangements there is no one body that should be in control of access to stormwater. Would need to change the governance arrangements. As mentioned earlier in the chapter, one of the new approaches to achieve improved governance is privatisation of public infrastructure including water infrastructure assets. In 2012 Infrastructure Australia prepared a paper titled Australia’s Public Infrastructure – Part of the Answer to Removing the Infrastructure Deficit that backed the idea of Australian governments transferring publicly owned infrastructure to the private sector and using the net proceeds to build the new infrastructure. The report further suggested that transferring existing infrastructure to the private sector would also achieve significant broader economic productivity benefits from introducing private sector discipline, improving the ability to finance the expansion of infrastructure as required, greater transparency in the costs of community service obligations and improved governance – where the government is no longer both the regulator and the owner. The report identified 82 profit-making government assets that could be sold relatively quickly – in some cases within a year – and without major regulatory changes. It also recommended selling the assets, which include power generators, airports, ports and water utilities, to Australian superannuation funds, which are particularly attracted to the steady yields offered by public assets and would help overcome political opposition to the privatisation idea. Within the water industry, the report identified ten water infrastructure assets with a hypothetical enterprise value of AUD$37.5 billion (US$33.1 billion) which could potentially be sold to the private sector in order to generate cash to tackle the country’s growing infrastructure deficit. A follow-up report released in 2013, entitled Australia’s Public Infrastructure – Update Paper reinforced this point of selling public assets to fund infrastructure projects. However, in the absence of a level regulatory playing field, the move is unlikely to be followed up with any tangible action. To address this issue, the Infrastructure Australia: 2013 State of Play Report recommended setting up a national water regulator to “provide stability, a clear national policy objective, improve opportunities for private sector investment through great accountability, less red tape, and appropriately put distance between a state-owned business and the regulator”. Amidst all these developments, Australia’s former Finance Minister Mr. Hockey had offered states billions to sell off their assets. Under the deal to promote infrastructure investment, the states would have to agree to privatise assets. The corporate tax the private owner would then pay to the federal government will be returned to the respective state government as a tax equivalent incentive payment. Currently state government-owned corporations do not pay company tax. Consequently, in the interests of competition, these corporations must pay state governments a tax payment equivalent to what the corporation would pay if subject to federal company tax. However, water privatisation is a highly controversial topic and touches on the much broader arguments for and against the private control of formerly public services. For example, see Box 6.1 about a dispute between private water suppliers and the state government in Adelaide with regard to supplying drinking water. The Adelaide Hills Face Zone suburb of Skye was left without water for showering and flushing toilets for three days this week coinciding with a spell of extreme fire danger. The problem was blamed on a dispute between two independent water companies and a local council that does not believe it has any responsibility. Despite Skye being just 8 km from the CBD, its residents have been without mains drinking water since the area was subdivided 50 years ago. SA Water and the State Government at the time decided it would cost too much to bring mains water to Skye, making it difficult for blocks to be sold until the Foothills Water Company started digging bores to provide water. About 100 locals sent a petition calling for a mains water supply to Burnside Council in September 2008, which was forwarded to SA Water. With any extension to its network, SA Water requires two-thirds of the residents to agree to it – at a cost of $26,500 per property. But many residents did not want to pay and were content with their water supply, which is unaffected by water restrictions, and refused. Instead, they rely on five different private companies whose pipes pump water from bores, while others rely solely on rainwater tanks. The water is suitable only for washing and gardening, not drinking. In 2010, the Federal Government rejected a $3 million funding application from Burnside Council to have the suburb connected to mains water. Water provided by one of these companies, the Foothills Water Company, has announced it will cease operating from August. Foothills Water Company director Murray Willis decided to wind up his company because he faced a $2 million bill to replace pipes. He placed blame for the pipes’ demise squarely with Burnside Council, saying it refused to remove pine trees which were damaging his pipes. He and the council have been involved in a long-running conflict over who should foot the bill for the repair the pipes. Burnside has paid for some of the repairs. Burnside chief executive Paul Deb said the council had never received a request from Mr Willis to have trees removed. He said the pipes were installed in the mid-1960s and only had a life expectancy of 65 years before they needed to be replaced. The online survey explored perceptions of three urban communities in South Australia and Queensland about water governance arrangements and their understanding of the local water planning process. Water planning is the core of water governance, and effective water planning is fundamental to the NWI and is the best way for determining how different sectors share valuable water resources among competing uses (NWC 2004). The results of this study go some way to inform decision-makers in terms of the community’s perspectives on the question of the new era post the Water Act 2007, which is At which point or points in the Australian government structure should urban water supply be governed? The issues addressed in the survey were presented in the form of attitude statements, and the findings are presented in the following sections. Overall, there was disagreement among the respondents on water governance responsibility being clearly defined between the federal, state and local governments in Australia. However, the majority of respondents agreed that the federal government should take the main responsibility for water governance (Figs. 6.6, 6.7, and 6.8); these findings are in line with those of Brown (2007) who reported that the bulk of Australians support federalism in Australia and believe it is time for many areas of state government regulation to give way to uniform national plans. The study (Brown 2007) further argued that many citizens favour the idea of Canberra taking power because of the inability of the current states to deliver on many crucial issues and are no more likely to do so in the future. The findings of this study support this argument in the context of water governance since the communities clearly favoured a federal system of water governance (Table 6.6). Ranking order for question: Who do you prefer to be governing Australia’s water resources? When asked to rank their preference for various authorities to be governing Australia’s water resources, the federal government was given the first priority followed by the National Water Commission (NWC) which is a statutory water body established under the National Water Commission Act 2004 1 advising the Australian Government on national water issues. Therefore the NWC could be viewed as a federal authority as well, implying that the communities favoured the idea of Canberra taking over the power of water allocation and water planning from the states. The water suppliers were the least preferred (Table 6.4). Respondents were invited to suggest any other ways to govern Australia’s water resources, and we received replies such as “An independent Australia wide authority, with absolute power over all aspects of water supply & usage” and “An independent umpire” which further support our argument of federal water governance. Some replies mentioned the issue of public involvement by stating “I believe the public should have the rights to vote on what and how it should be done! !” or “should be a joint effort like a committee made up of all concerned authorities with a public consultation” which is clearly mentioned in the NWI clause related to community partnerships and adjustment (Clause 93, NWC 2004). Another issue which our study examined was how respondents perceived the water planning process in their respective state. Respondents were asked to rate their agreements with four statements related to their understanding of local water planning issues (see Figs. 6.9, 6.10, and 6.11). Overall, respondents indicated that they did not have a good understanding of the state government’s water planning process. The findings show that generally respondents did not agree that the current water planning process had worked well in their regions; neither did they believe that the aim of the current water plans is to achieve a sustainable use of groundwater in the country. However, respondents were fully confident that it is possible to have sustainable water allocation policies in local regions. The major challenge facing Australia is to balance water usage for residential consumption, irrigation, industrial consumption and other uses with provision for appropriate environmental flows. In agreeing to the first round of water reforms, COAG 1994, the Australian government formally acknowledged that rivers, catchments and aquifers are not constrained by state boundaries and that water activities in one state could have impacts in other states (Chartres and Williams 2006). The second round of water reforms known as the National Water Initiative (NWI) recognised the continuing national imperative to develop an efficient and sustainable water use in Australia (Chartres and Williams 2006). The findings of this study suggest that there is a need for the third water reform in which water governance at national level would be established. Besides, the country has to choose between more expensive capital investment like desalination plants and environmental options like stormwater storage and use via managed aquifer recharge which was strongly supported by the respondents. Nevertheless, the question on the extent to which and for what uses the community accepts the use of stormwater needs to be researched, although our study (Keremane et al. 2011) has partly touched upon some of these issues from a community perspective. With regard to implementing an integrated urban water management strategy in Australia, there is no “one size fits all” structural arrangement. While there is growing support for implementing a portfolio of water supply sources, it is also true that there are impediments to implementing this approach. These impediments are not generally technological, but are, instead, socio-institutional and in policy and legal areas (Keeley and Scoones 2003; Gupta 2007; Uhlendahl et al. 2011; Keremane et al. 2014). In addition, most of the challenges are related to the “new” water sources – stormwater and recycled wastewater. Results of the present study corroborate this finding in that the major policy and legal challenges highlighted by key stakeholders were related to treated stormwater and recycled wastewater. The most commonly identified impediment was the lack of a coordinated institutional framework revealing poor inter-organisational collaboration and coordination. In particular, the issues included the lack of an integrated water management plan, fragmented roles and responsibilities, unclear property rights and the lack of one leading agency to implement IUWM, often resulting in organisations being more reactive rather than reinforcing a proactive operational culture (Brown and Farrelly 2009). Fragmented and unclear roles and responsibilities relate not only to internal issues within organisations but also between and among other organisations. As Brown (2008) points out, addressing these issues and achieving sustainable urban water management may require institutional change and extensive redesign of organisations and their basic operating practices (Brown 2008). This requires engaging the governments, corporations and society in a three-way collaborative effort (Chiplunkar et al. 2012). The focus therefore has to be on implementing institutional change through reform approaches that emphasise the introduction of developed coordinating mechanisms and an improvement in intra- and inter-organisational relationships (Briassoulis 2004; Mitchell 2005). This means creating favourable institutional contexts, with the appropriate mix of public and private actors who are supported by coherent legislative and policy frameworks (Bahri 2011). This may require modifying existing legislation and policies to conform to a consistent framework based on the NWI principles in implementing a diverse water supply portfolio. However, achieving (cultural) transformations to encourage institutional change for implementation of an integrated urban water management approach may take several years, and therefore planners and policymakers must have a long-term framework for addressing these issues. Looking ahead, there is scope for further research to explore the intergovernmental issues and provide models to enable this transition and hence be a model for the world in portfolio approaches. In 2014, the National Water Commission Act 2004 was repealed, and the National Water Commission was abolished. The funding and support of the Goyder Institute for Water Research and the National Centre for Groundwater Research and Training is greatly appreciated. The authors would like to thank all participants who gave their time to participate in the voluntary interview process and online survey supporting this work. These included personnel from the local governments, state government departments, natural resource management boards, private sector and community organisations. The authors also thank the participants from the Cities of Salisbury, Charles Sturt and the Gold Coast for their time and participation.